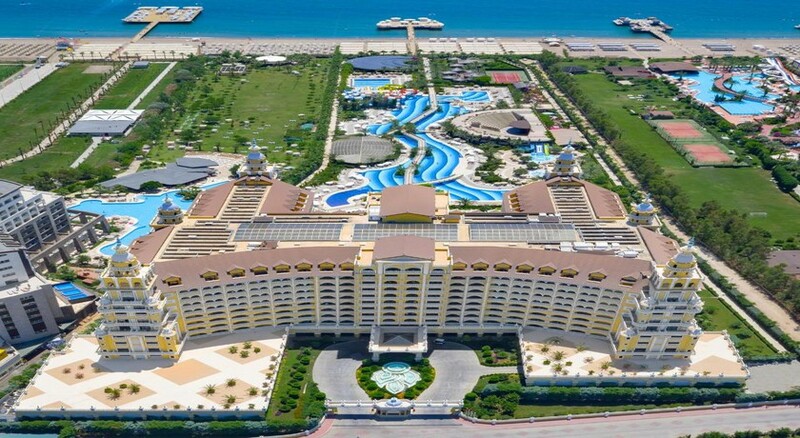 If a luxurious all-inclusive destination in Antalya is on your mind, check out Royal Holiday Palace. This destination is celebrated among families and couples for the waterpark it houses. It also features four main restaurants, five a la carte restaurants, 11 bars, 1 waterpark and numerous recreational activities. Accommodations in Royal Holiday Palace are divided into 461 Superior Rooms, 56 Family Rooms, 47 Duplex Rooms, 24 Deluxe Suites, 7 Suite Rooms, 6 Handicapped, 2 Triplex Suites and 1 King Suite. The décor in the guestrooms is simply posh, and come furnished with facilities such as mini bar, air conditioning, TV with satellite, en suite with complete bath amenities, hairdryer, electronic safe deposit, sofa, telephone, and WiFi internet. Rooms are cleaned daily and linens are changed thrice a week—cribs and non-smoking rooms are available on request. Palace, the main restaurant serves breakfast (7am to 10am), late breakfast from (10am to 11am), lunch (1pm to 2:30pm) and dinner (6:30pm to 9pm), while Bambino, the kid’s restaurant serves breakfast (7am to 10am), lunch (12:30pm to 1:30pm) and dinner (6pm and 7pm). The Turquoise Snack Bar operates between 12:30pm and 3pm, and the Palace Snack & Patisserie opens from 12am to 7am and 4pm to 11:30pm. There are five a la carte restaurants: Vapiana (Italian – 6:30pm and 21:30pm), Hashi (Asian – 6:30pm and 21:30pm), Lal (Grill) Restaurant (Turkish – 6:30pm and 21:30pm), Deep Blue (Seafood & Mediterranean Sea – 6:30pm and 21:30pm) and El Torito (Mexican – 6:30pm and 21:30pm). 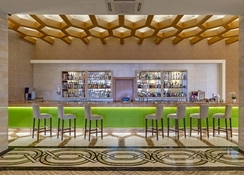 In addition, there are 11 bars and lounges: Vitamin Bar, Pera Lobby Bar, Piano Lobby Bar, Pool Bar, Pier Bar, Terrace Bar, Turquoise Snack Bar, Amphi Bar, Oxygen Disco Bar, Bowling Bar and Cafe Turk. Except for the Vitamin Bar, all the bars and lounges serve a wide collection of cocktails and mocktails and other premium local and international liquors. The hotel features an outdoor swimming pool, a kid’s paddle pool and an indoor pool—there solarium, loungers and parasols around the pools. Few activities you can look forward to during day time are table tennis, water polo, water gym, bowling, step aerobics, morning exercise, boccia, billiards, pools and darts. At evening/night you can enjoy professional dance shows, live music, friendly competitions and disco parties. But the thunder goes to the aquapark that houses 5 adults slides, 3 kids slides and many other thrilling installations. 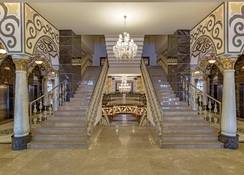 Check out the luxurious wellness centre that offers Turkish bath, steam bath, capsule treatment, Jacuzzi, skin and body treatments, vitamin bar, massages and sauna. Meanwhile, children between the ages of 4 and 12 years can also join the mini club where professionals conduct/organises face painting, table games, workshops, t-shirt and sand painting, mini basketball, and etc. 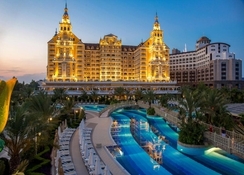 Royal Holiday Palace located in Lara Tourism Centre (Antalya) is a five-star hotel that features 604 fancy guestrooms. Launched only in April 2011, this is a seafront destination that spreads across 53,000 sqm. The beach is right in front of the resort—this is where water games and activities are conducted throughout the day. The Antalya City Centre is 17 km away, and the Antalya International Airport is 15 km away from the hotel. The Lara strip is also very close to the resort, where you’ll find tons or restaurants, shops and cafes. 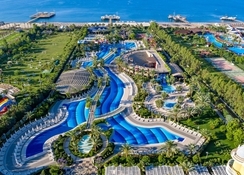 Also the National Gold Club, Antalya Golf Club, Carya Golf Club, and Ata Uluslararasi Golf Kulubu are not far from the resort. *** Waterpark timings: 10am to 12pm and 2:30pm to 5:30pm. I couldn’t fault the hotel it was excellent we went for 2 weeks and the kids loved it cause it was all about the kids in this hotel and the kids club staff always on hand to take your kids and just bringing icecreams/lollies around on rollablades and little fridges everywhere with cold water for you to help yourself but we will defiantly be back 11/10.